Skirts, which come in so many varying lengths, fabrics, colours, and patterns, are the perfect summer-to-fall transitional piece. They allow you to subtly shift your wardrobe for the upcoming season, without sacrificing comfort in still-sweltering temperatures. From anything-but-boring pencil skirts to flirty miniskirts, we’ve sourced the hottest styles to take you from the dog days of summer through harvest season. Scroll down to shop our favourite summer-to-fall transitional skirts! Eyelash fringe is an adorable finishing touch on this tweed mini skirt. Tap into the pleated trend with this option, which comes in fall-friendly colours. A chic leather skirt at this price point is a must-have. This pale pink skirt transitions nicely into fall thanks to its structured silhouette. This slim take on a ladylike midi skirt is ultra-flattering. An asymmetrical fringe hem has major sartorial impact on this knit mini. This miniskirt feels both ‘90s-inspired and modern. Try this dressy pencil skirt in place of your typical cocktail dresses. An edgy designer skirt is an investment that you’ll reach for repeatedly. You’ll get plenty of use out of this minimal skirt. Dress down this lacy piece with a casual t-shirt and pointy-toe flats. Come fall, you’ll want to wear this neutral animal-print skirt with opaque tights and ankle boots. Depending on your profession, this sleek denim skirt might be refined enough for the office. Pair this skirt with a chambray top through summer, and with a slouchy cardigan for fall. Isabel Marant’s skirt proves that wrap-style versions are always cool. You’ll be the best-dressed at the office in A.L.C.’s chic print. The combination of plaid and bold florals makes this an eye-catching piece. The skirt’s tulip shape and its understated colour speak to our feminine sensibilities. This cobalt blue skirt’s tasteful front slit adds an interesting element. An adjustable drawstring waistband makes this wrap skirt ultra-comfortable. Sandro’s leopard print-skirt features a unique sporty waistband. 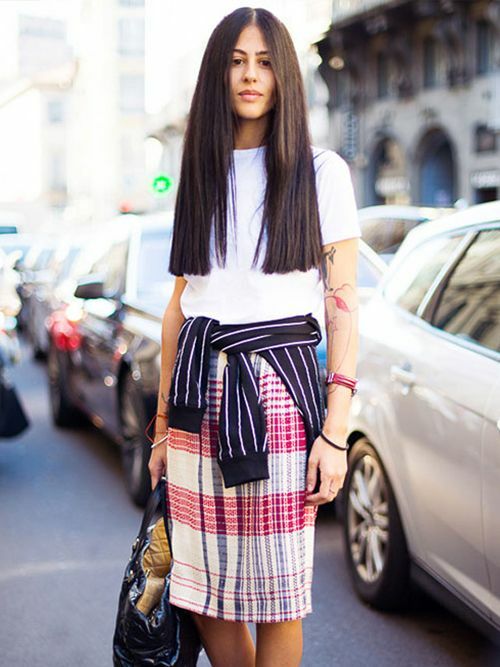 What’s your favourite skirt style to wear when transitioning from summer to fall? Tell us in the comments below!